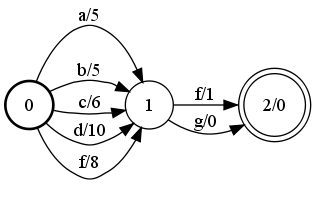 This operation transforms each arc and final state in the input FST. 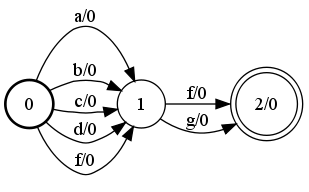 The transformation is specified by a function object called an arc mapper. For instance, RmWeightMapper replaces the weight of every arc and final state by 1. A list of available arc mappers and instructions on how to create them are given here.
) type: string default: "identity"
Note fstmap also includes state mappers. where V = # of states, E = # of arcs in input FST, c = cost of processing one arc by the mapper and m = total memory usage for the mapper. where v = # of visited states, e = # of visited arcs in input FST, c = cost of processing one arc by the mapper and m = total memory usage for the mapper. Constant time and space to visit an input state or arc is assumed and exclusive of caching. For instance in the case of RmWeightMapper, we have c = O(1) and m = O(1).